Newspaper headlines report on a seemingly never-ending stream of stories that reflect on the breakdown of ethical standards at every level of our society. As a result, top-level government institutions, major media outlets, and leading companies, in both the private and public sector, face a dramatic loss of Trust in the eyes of the public – and between each other. In the meantime, leaders at every level, acknowledge the critical role that Ethics and Trust play in the workplace and in the success of our institutions. The Challenge: Few people can define what Trust is, no less evaluate or measure it – or have specific Ethical Strategies to develop and maintain it. Barometer reveals that trust in the U.S. has suffered the largest-ever-recorded drop in the survey’s history among the general population…. The collapse of trust in the U.S. is driven by a staggering lack of faith in government, which fell 14 points to 33 percent among the general population. The remaining institutions of business, media and NGOs also experienced declines of 10 to 20 points. 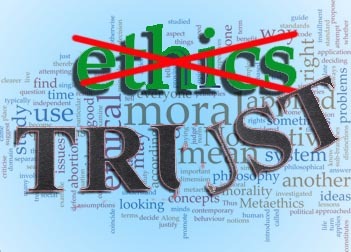 An exploration of the dynamic relationship between Ethics and Trust. An easy-to-understand, yet comprehensive model of the core principles of Ethical Trust – on a personal, company, and global level. 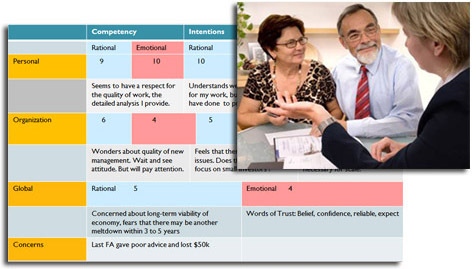 A simple methodology to evaluate and measurethe Levels of Trust between individuals and organizations – both internally and externally. Effective and actionable strategies based on Ethical Principles to develop and maintain Levels of Trust – on both personal and organizational levels. How Ethical Trust improves operational impact and efficiencies. The program was originally developed in conjunction with one of the nation’s top-tier Wall Street firms in response to the ethical challenges and loss of trust after the 2008 financial crisis. Speaking “truth to power”, the program became one of the company’s highest-rated educational programs. Our program has been updated and revised to address today’s issues of Ethics and Trust in general business, governmental, and non-profit organizations. The Power of Ethical Trust is proactive. Its goal? To improve how organizations function. How? By optimizing Levels of Trust between stakeholders by the application of easy-to-follow, ethical standards and strategies.